Would you like to know the difference between a hummer and a ringer type PEMF system? I’ve been asked to explain this difference many times because it’s the main difference between PEMF Devices. Here is an explanation – of my opinion of the differences. Topic is complex – and different technologies are described with the similarly – leading to confusion. In spite of these factors, a large and growing population of individuals with positive experience to the a tipping point and generally recognize that energetic devices have affected their health enough for them to buy one. Resonant devices are most easily explained with a picture. These are waveforms like those produced by different resonant devices. The amount of time it takes for one complete waveform is called the period, and the number of cycles per second is called the frequency. The shapes of the waves reflect the waveform. Sometimes these devices will “sweep” which is to go from one frequency to another – but they always output a repeating signal. 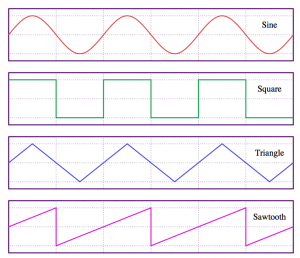 The characteristics that characterize resonant devices around a particular frequency. Resonant device manufacturers that the word “pulse”, as in pulsed electromagnetic device, mislead their readers – because a “Pulse” is a very different waveform than any of these regular repeating waveforms. Pulsed devices utilize the concept of frequency because they tune to a specific frequency to activate one or more energetic structures by “singing” a frequency. This can be very beneficial. Royal Rife used frequency extensively to target microscopic dimensions of organisms to explode them. Let’s talk about true pulses now – or Ringers. A Pulse is a discrete event, like a blast – triggered from a sudden release of energy. 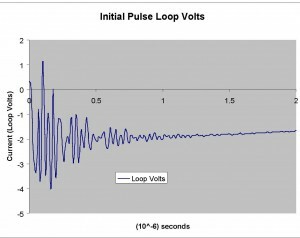 Here is what a pulsed waveform tends to look like. Note that this is a single event. The ups-and-downs are echoes that happen when energy bounces around the antenna before it leaves. Pulse events tend to make items resonate at their own frequency. Think about ringing a bell – you hit the bell and it rings. The hit is the pulse, and the ringing that happens – is at the frequency defined by the bell. So if you graph a ring – there’s the hit – and then the ring. The frequency of the ring comes from the entity that received the energy. Pulsed Magnetic Devices – make cells ring at their own frequency. Cells are like bells. Magnetic devices are either hummers or ringers. Here are a few clues to help you sort them into different categories. Does it run on a spark or high voltage generator? Does it have a powerful pulse – measured in 1000+ Guass? Does it make a noise when it triggers? A true Pulsed Electromagnetic Device will usually answer yes to all these. That said, we do care about the other devices because we feel it’s important for our audience to understand why the differences may be important to them. Does it have declare square or sawtooth wave? Is the device focused on delivering a “frequency”? Is the power described as Gauss <300 ? If you answered yes to these questions then it’s probably a Resonant Device that produces a waveform instead of a pulse. There are two different categories of devices, and they are as different as cats and dogs, but both are animals because both use an electro-magnetic field to trigger physiological effects. Like animals, the characteristic of the field defines the effect. Rsonant and Plasma Discharge fields are very different in character, and therefore effect. As dogs are poor at catching mice, cats are poor at keeping foxes out of the chicken house. The performance and cost of each device suits different needs. Harmonic Spectrum TSSDs have a much stronger and higher harmonic frequencies. See Eigen Modulation. Strong High Frequency Much lower high frequency intensity from switched low power controls instead of “plasma”. Enhances Pharmacokinetics TSSDs increase cellular delivery of nutrients and pharmaceuticals. Yes. Increases uptake of therapeutic agents, Vitamin C, anti-pathogenic agent, to localized areas during electroporation. No Known effect. Detox Management TSSDs are much more potent. Elevated respiration shifts cell toxins more and is more likely to cause detox challenge. Yes. Prolonged exposure causes very elevated cellular exchange which can flood exit paths resulting in Herxheimers reaction Uncommon. Excess exposure does not tend to cause detox challenge. Cost TSSDs cost more. They usually cost between 3-5x of harmonic devices. High voltage components are expensive. Microprocessors and low power amplifiers are inexpensive. Typical Response Characteristics There is some overlap, but the severity of the condition should guide usage. Repair – provides stronger and more immediate health effect. Exhibits direct anti-pathogen effect for some bacterial strains Maintenance – Tunes and stimulates cellular performance by frequency. Suggested Application Severe Issues – Acute and chronic issues At home maintenance. So, in our opinion, both are valuable. Resonant devices tend to fit health-maintenance requirements, while Plasma Discharge Devices tend to be better suited to health repair applications. This forum specifically addresses to pulse discharge devices or Plasma Discharge Device, which are different from resonance devices which utilize various waveforms.